Over 230 exhibitors will be on hand with lots of inspiration for your home – inside and out. Special events are planned, including the ever-popular ‘Ask an Expert.’ Celebrities include Jonathan and Drew Scott of HGTV’s “Property Brothers.” And you’ll find the latest for your home showcased along Innovation Avenue. 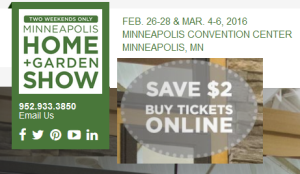 Visit the show’s website for details and special discounts on tickets. We always look forward to this show each year, but this time we’ve got an even better reason: we’ll be unveiling the prototype for our new Fire & Water Table. This gorgeous fire element has already gotten raves from those who have seen it, and we’re looking forward to being able to incorporate it in landscape designs this year for homeowners who are looking for something dramatic for their patios, decks, and other outdoor living spaces. This stone-topped table is bar height, so you can pull up stools around it. The gel-based fire dances in its glass surround that’s filled with bubbling water. Fire and water are always an exciting combination, and this custom-designed piece is sure to get attention. We’ve got lots more exciting things to share with you. 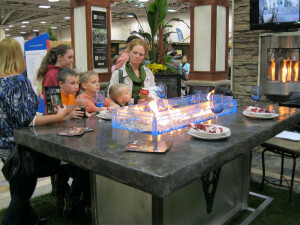 Stop by and see us and let us know what you think of our new custom Fire & Water Table! Architectural Landscape Design, Inc. is a licensed MN landscape contractor, and in addition to landscape design and installation, we also offer custom natural stone outdoor furniture, like the Fire & Water Table shown here.